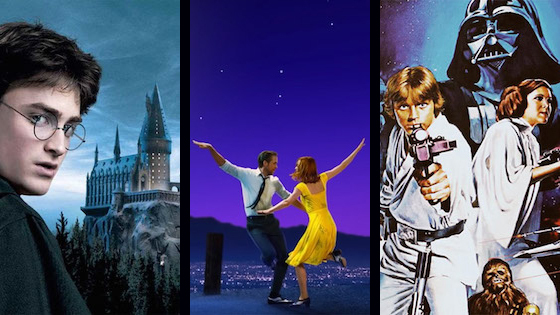 V.com weekend vote: Should certain movie soundtracks be considered classical music? February 24, 2017, 11:59 AM · With the Academy Awards coming up this Sunday, I thought a movie-music vote was in order! Here is the question I've been pondering: should certain movie soundtracks be considered classical music? Now, obviously I'm not referring "Classical music," music from the period between 1730 and 1820 that encompasses the time of Mozart. I'm referring to the more generic use of the term "classical music," with a small "c," the term we commonly apply to Western art music, which ranges from Renaissance church music to Beethoven symphonies, from the Rite of Spring on through 21st century music. Why would I consider such a thing? Because it would seem that, over the years, soundtrack music has become a fixture in the classical world. Driving around Los Angeles this week, for example, I noticed that the classical music station has been airing movie soundtracks almost non-stop, in preparation for the upcoming Oscars. I've heard music from La La Land, Rogue One, Moonlight (which does some interesting stuff with violin sound)...the list goes on. For a long time, symphony orchestras have featured "night at the movies" concerts, and in recent years the Hollywood Bowl actually screens full movies, with the score played live by the Los Angeles Philharmonic. Certainly movie soundtracks are long-form art music. As with any other genre of music, the quality of soundtracks varies widely, from genius invention to complete schlock. If you are a classically-trained composer in the 21st century, soundtrack music -- for movies, video games or shows -- is certainly one of your most promising options for employment. I would even argue that the soundtrack is one of the most relevant new-music forms of our current times. Should it fall under the umbrella of "classical music"? Please vote, and then tell us your thoughts about it. February 24, 2017 at 09:43 PM · "The Great Escape," "Magnificent Seven," "Hawaii" and "The Little Mermaid." Gotta say "Yes." February 24, 2017 at 10:03 PM · Yes. I think John Williams' movie soundtracks (and others) will be remembered and played 200 years from now. February 24, 2017 at 10:18 PM · Perhaps we need to re-think the idea of modern classical to mean large orchestra music using traditional (and some non-traditional) instruments. After all those famous composers wrote music for the purpose of entertainment for their benefactors, the public and to communicate a message through the medium of both theatre and church. Music is a form of emotional communication. Modern classical is just the latest form of emotional communication using most of the familiar instruments and frankly these are the folks employing a lot of musicians and frequently getting the audience members to (someday hopefully) explore the traditional composers that they think they don't like. We cannot know how music will evolve or what music will still be played centuries in the future or even if our beloved strings will still be played by professionals and amateurs. I'd like to think that they will and the music will continue. We can only hope that it does and that our ancestors will continue the traditions we maintain today. February 24, 2017 at 10:58 PM · Yes. If Mozart or Beethoven were alive today, I imagine they would be composing movie soundtracks. February 24, 2017 at 11:56 PM · Absolutely! February 25, 2017 at 12:37 AM · A sizeable proportion of classical music composers who had the opportunity to provide movie soundtracks did so. Some of such soundtracks have been considered classical music for years, e.g., Waltons' Henry V, Britten's Young Person's Guide. Korngold has recently been resurrected as a classical composer. Some of Vaughan Williams's soundtrack for Scott Of The Antarctic found its way into his 9th Symphony. Three others that come to mind are Arthur Benjamin, Alan Rawsthorne, and Malcolm Arnold. This doesn't include extracts from, for instance, the soundtrack for 2001 A Space Odyssey, etc. February 25, 2017 at 02:05 AM · As a kid I thought Addinsell's "Warsaw Concerto" should make the list. Is it well thought-of these days? February 25, 2017 at 10:55 AM · Yes, indeed! In fact, many movie soundtrack composers such as Korngold and Williams are already considered of the classical genre. February 25, 2017 at 01:18 PM · I don't go to the cinema very often, so I'm not all that familiar with the music in many modern blockbusters. However, I have heard played in concert on a couple of occasions the evocative "spikey" score you hear in "Psycho". February 25, 2017 at 09:03 PM · Wow! Is that true? I'd believe it; the first page of Hedwig's Theme is insane for the violins. February 26, 2017 at 03:18 PM · I voted yes. If Strauss waltzes are considered classical music, I don't see why movie soundtracks should be treated differently. February 27, 2017 at 02:55 PM · I believe some movie soundtracks ought to be considered Modern Classical. It's orchestra-centred music that occasionally features new, unknown/obscure and eastern instruments. If someone writes a concerto for electric guitar and orchestra, it is modern classical. Modern classical is a huge spectrum of music types. I'm sure in their own time, the baroque, classical and romantic composers considered their own works to be different genres than their peer composers. I am a modern classical composer, but I do not compare myself to Richard Meyer, for our music is nothing alike.